Inspects metal obstructions in front of the tunneling machine tunneling through metal obstructions in front. The tunneling machine can detect obstructions up to 2m away. 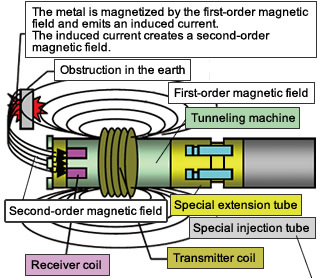 A transmitter coil installed in the tunneling machine emits electromagnetic waves which magnetize metal obstructions in the earth (first-order magnetic field). The magnetized metal obstruction emits an induced current, creating a second-order magnetic field. 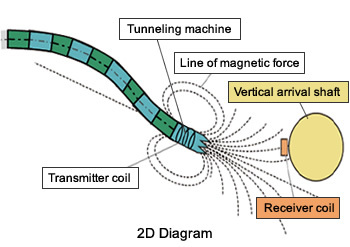 The second-order magnetic field is detected by the receiver coil of the tunneling machine, causing the tunneling machine to judge that there is a metal obstruction. Ground improvement is performed in front of or behind the metal obstruction using the tunneling machine Cutting an obstruction takes time. This can cause the ground around the cut area to sag, causing surrounding underground structures or the ground surface to sink or rise. Ground improvement is therefore performed to prevent this. 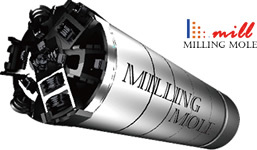 The Milling Mole Method allows ground improvement to be performed using the tunneling machine in cases when it cannot be performed from the ground surface. The tunneling machine includes a special injection tube that makes it possible to improve and stabilize the ground behind the obstruction. 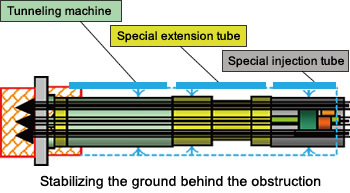 The boring machine is attached to the special injection tube, and an injection rod is pushed toward the obstruction from a dedicated valve in the wall of the tunneling machine to cut through the obstruction and perform ground improvement on the area behind it. It is also possible to extend this from the side of the machine and improve the area around the tunneling machine. A chemical is injected in four directions from three places in the machine to stabilize the ground around the cutting area so that it can be cut safely. Metal obstructions cut into a powder and removed The Milling Mole Method comprises three pieces of equipment: a tunneling machine, a special extension tube and a special injection tube. The tunneling machine is fitted with a special bit for cutting obstructions and contains a transmitter coil and receiver coil for inspection of obstructions. This cutter bit can be replaced. 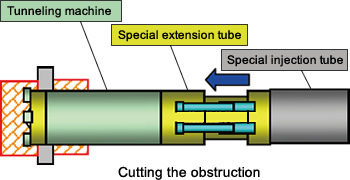 The special extension tube is used to push the tunneling machine into the obstruction at an ultra-low speed when cutting the obstruction. The special injection tube includes equipment for improving the ground in front of the tunneling machine and behind the obstruction. Using the special extension equipment, the tunneling machine cuts the obstruction at a speed of 0.1mm/min. A benefit of the Milling Mole method is that it turns metal obstructions into powder (iron powder), which is then taken into the device with ordinary sludge and transported to the ground surface by vacuum transportation. The tunneling machine is guided to a predetermined position on the vertical shaft. A receiver coil is installed in a predetermined position on the vertical arrival shaft to guide the tunneling machine to that position. At around 40m before the arrival shaft, the bearing angle of the tunneling machine is calculated and displayed in real time. The transmitter coil wound around the end of the tunneling machine emits electromagnetic waves. The receiver installed at the arrival target receives these waves and determines the position of the tunneling machine. An electromagnetic induction measurement device (Neojust system) to accurately guide the tunneling machine is already commercially available and has been used with a large number of successes. *Conditions apply for the φ800 and φ900 models.